Welcome to this issue of newsletter delivers you updated info. Thank you for your continuously support to RAYSTAR News. In May, we will introduce 7” & 10.1”TFT modules. 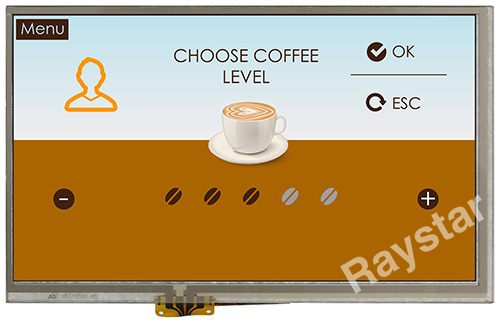 RAYSTAR 7" RFH70XB-1IW-LHS is a medium-sized HDMI display, made of high resolution 1024x600 dots. 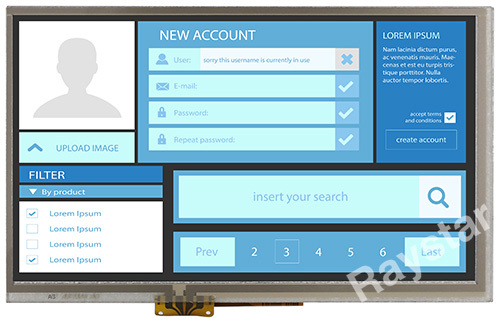 This 7 inch TFT Display RFH70XB-1IW-LHS comes with a board having HDMI interface and a 40-pin connector on it; it is designed to make Raspberry Pi usage become easily. This TFT display has a USB interface Resistive Touch screen overlay on TFT panel. As to the Capacitive Touch Panel, it is still under development and it will be released soon. We designed a HDMI connector part no. WWHDMI-00# for option, the customers can use it to connect RFH70XB-1IW-LHS module with your Raspberry Pi directly. You can simply use this medium-sized TFT display with your Raspberry Pi, and also you can use it as computer display with any device which has HDMI output. 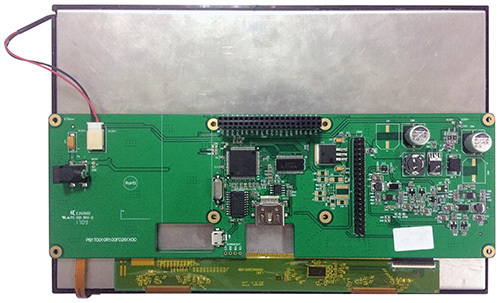 This 7" TFT model comes in 1024x600 resolutions that is high quality and would be good for embedded computing usage. Please note, this part no. RFH70XB-1IW-LHS does not include a HDMI connector or USB cable. RFF70XG-1IW-DHS is a 7 inch medium-sized HDMI TFT-LCD display, made of resolution 800x480 dots. This 7 inch TFT Display comes with a board having HDMI interface and a 40-pin connector on it; RFF70XG-1IW-DHS is designed to make Raspberry Pi usage become easily. This RFF70XG-1IW-DHS TFT display has a USB interface Resistive Touch screen overlay on TFT panel. As to the Capacitive Touch Panel, it is still under development and it will be released soon. We designed a HDMI connector part no. 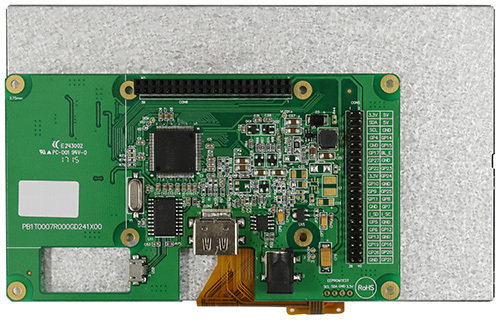 WWHDMI-00# for option, the customers can use it to connect RFF70XG-1IW-DHS module with your Raspberry Pi directly. You can simply use this medium-sized TFT display with your Raspberry Pi, and also you can use it as computer display with any device which has HDMI output. This 7" TFT display is 800x480 resolutions, which is just enough to run most software, but still small enough that it can be used in portable or embedded projects without the bulk. Please note, this part no. RFF70XG-1IW-DHS does not include a HDMI connector or USB cable. RFK101XF-1YH-LHS is a 10.1 inch high brightness version TFT display with incredibly high resolution and great angle-visibility. This 10.1” TFT display is having IPS TFT panel with a HDMI interface output, it's made of high resolution WXGA 1280x800. 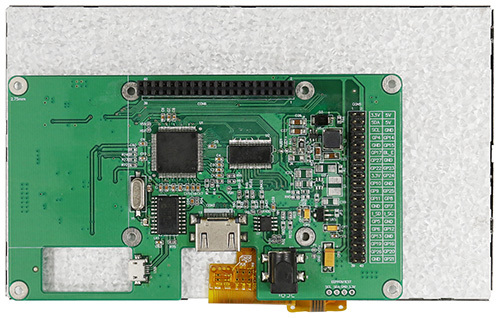 This 10.1" TFT RFK101XF-1YH-LHS comes with a control board with HDMI interface signal input; it is designed to make Raspberry Pi usage become easily. 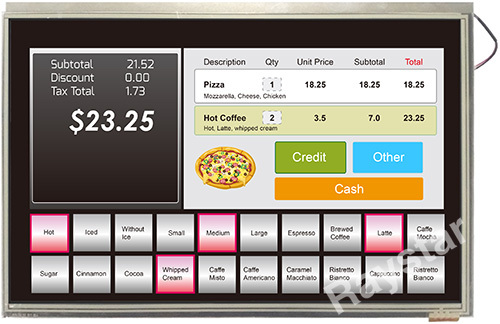 RFK101XF-1YH-LHS has a USB interface Resistive Touch screen overlay on TFT panel. As to the Capacitive Touch Panel, it is still under development and it will be released soon. 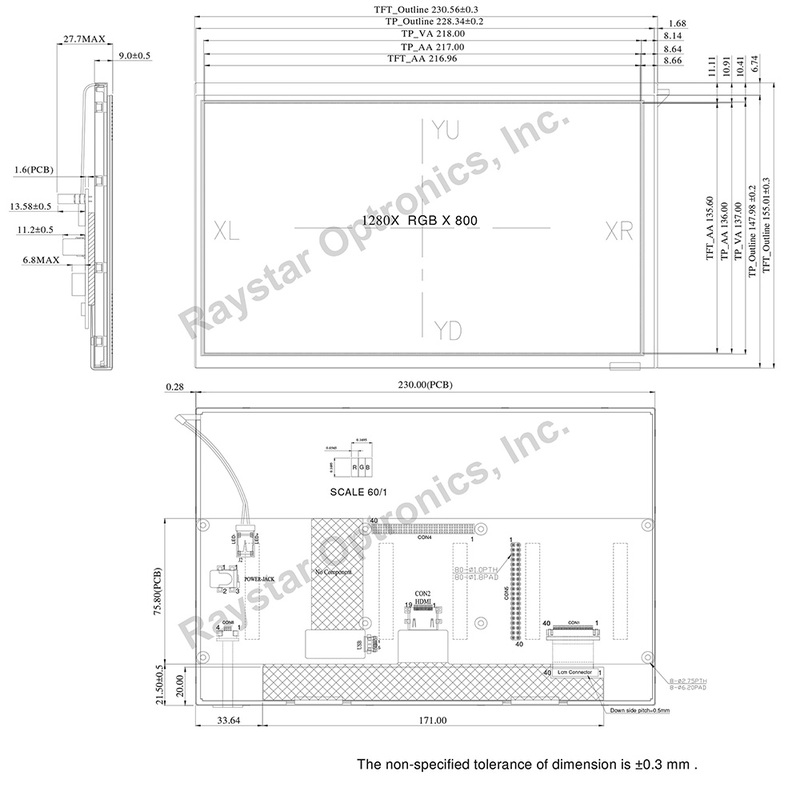 RAYSTAR has a HDMI connector part no. WWHDMI-00# for option, the customers can use it to connect RFK101XF-1YH-LHS module with your Raspberry Pi directly. You can simply use this TFT display with your Raspberry Pi, or also you can use is as computer display with any device which has HDMI output. This 10.1" TFT model comes in 1280x800 resolutions that would be good for embedded computing usage. Please note, this part no. RFK101XF-1YH-LHS does not include an HDMI connector or USB cable.